The Guard is a fish out of water, buddy cop movie about two men on the opposite side of their professional spectrum being thrown together with hilarious consequences...sound familiar? While The Guard may sound it on paper, this is not your typical fish out of water, buddy cop movie about two men on the opposite side of their professional spectrum being thrown together with hilarious consequences. 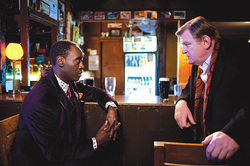 Brendan Gleeson plays a rather foul-mouthed, racist member of the Irish Garda, who an FBI agent played by Don Cheadle, cannot decide whether he is really smart or really dumb. The two are thrown together after a series of murders related to an international drug smuggling operation. As somebody remarks in the final scene, throw in two girls getting their kit off (Which they do) and a happy ending (Which they arguably do) and you’ve got yourself a movie. The Guard is one of those films with many elements that shouldn’t work but do. John Michael McDonagh makes an impressive directorial debut, as he shoots this dry, dark comedy like a spaghetti western, with the landscapes of Ireland replacing those of America. The film is much more visually striking than it could have been and the cinematography is very commendable, as the story at hand doesn’t exactly lend itself to such expressive, cinematic photography. The film’s soundtrack also manages to make a gun fight which would be little more than a footnote in other more action orientated films, a genuinely exciting action set-piece, something this film is not loaded with. Brendan Gleeson has been an actor on my radar since his turn as Mad Eye Moody in the Harry Potter films (He was who I had in my mind for Haymitch when I first read The Hunger Games) and in The Guard he demonstrates why he is such a reliable actor. He doesn’t do anything grandstanding in his role, delivering all of his lines in a wonderfully dry way, where you cannot detect whether this man is genuinely stupid, or whether it is all a big act. The scenes between him and Cheadle are a delight to watch and sadly there are fewer of them than you would expect. Don Cheadle gives a good performance, however like most in the cast, it isn’t a performance that rises above the one note-ness of the character. Mark Strong gives a Mark Strong villain performance in this film and pulls it off well (He could play these villain roles in his sleep by now) However given his sensational, and in my view Oscar worthy turn in Tinker Tailor Soldier Spy, it is a shame to see yet another film which has him playing a role we have seen him inhabit what seems like a hundred times. The Guard is a film which is surprisingly plot heavy, something which is to be commended but also a reason why this film has an oddly sluggish pace given its 90 minute running time. The problem at the crux of The Guard is that the story just isn’t that good or interesting. The drug smuggling never really feels that important and the case that brings these characters together just isn’t very exciting or attention grabbing. Ultimately this film could have been much stronger if they had ditched the idea of one case behind the entire film or strengthened the one that they had. It’s ok having dry humour but when dry humour is matched by a dry plot, the whole film feels like a sandwich with stale bread...the filling is there but the support is rather bare. The humour in The Guard is one that will not appeal to a broad audience and this film is worthy for how unconventional it is. It’s not a film that plays by the Hollywood formula and is all the better for that. While at most times the humour is humorous it is let down by two things. First, DON’T WATCH THE TRAILER I say this as the trailer contains many (if not all) of the film’s finest lines and jokes. It is also feels that at times the film is trying rather too hard and doesn’t seem to have much else up its sleeve comedy wise than yet another ignorant line from the Gleeson character. The film has a surprisingly touching subplot involving the Gleeson character’s mother. The relationship between the two of them is well explored and the way in which that storyline is left and resolved is sentimental without being sentimental and actually draws a laugh. As mentioned in the opening paragraph of the review this film has a good deal of self-knowing humour as well, with the summarization at the end of how the film’s events would make a good movie highlighting how unconventionally conventional the film was. The Guard also won me over with its ending which was ambiguous, humorous and oddly melancholic. A cover version of leaving on a jet plane closing this film, like the film itself sounds like it shouldn’t work but it does...really well. 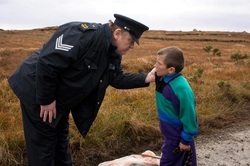 The Guard arrived being a box office sensation in Ireland and getting a large amount of critical praise (95% on Rotten Tomatoes) however I wanted it to be a bit funnier than it was and have more engaging plot than it did. For a film that is only 90 minutes long to drag is not right, however John Michael McDonagh shows great potential and while this does not match his brother’s In Bruges, it hopefully shows that we will be seeing a battle of the films between these two, or even better, a collaboration, in the future. A well-shot unconventionally conventional stale breaded sandwich. Disagree with this review? Give us your thoughts on The Guard in the Your Say section.